To drive more sales around the Super Bowl with a highly innovative in-store beverage display that is both eye-catching and functional. Innerworkings, a marketing execution services company, and client, Anheuser-Busch InBev (Budweiser), were looking for an innovative, high-tech POP design and display to put in liquor stores across the country themed to the Super Bowl in 2014. In a competitive retail environment saturated with other displays marketing the same sporting event, the display had to stand out. Innerworkings and Budweiser came to NEWP with a short, set turnaround time and requested a substantial display (not corrugated) that could potentially be used for other upcoming sporting events. New England Wire Products was tasked with creating a high-tech display for Budweiser’s beverage cases that would reflect the excitement, anticipation, and feel of the upcoming Super Bowl. NEWP generated many design concepts portraying the “energy” of a championship event. Various manufacturing materials and graphic elements were considered to accommodate a range of container sizes and best promote Budweiser’s beverages. The final, chosen design resembled an elite stadium, equipped with interchangeable trusses and graphics that educated the buyer on the advertised product. NEWP also added integrated LED lighting, a backlight box, and crowd noises complete with motion sensors to attract consumers. Initially, Anheuser Busch needed 500 racks for production. 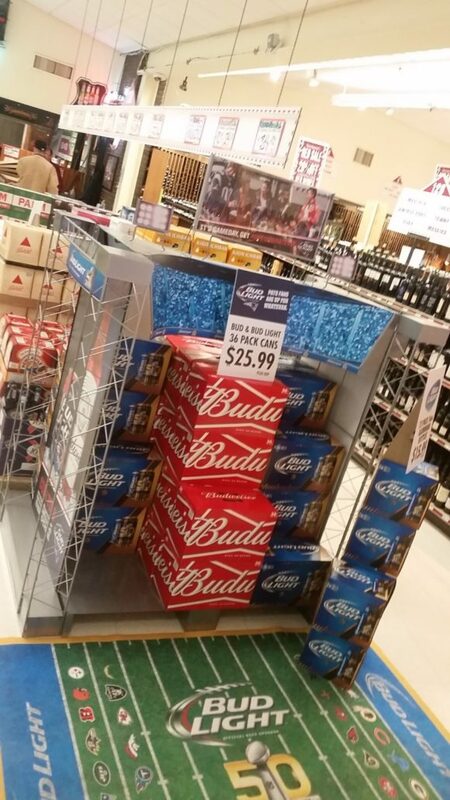 However, it was so pleased with the unique display that it ordered over 6,000 racks to be manufactured and distributed to liquor stores across the country, all within an 8 week timeframe. Unlike its competitors, NEWP’s agile production capabilities allowed it to deliver its promise, even with an incredibly short deadline. Due to the aggressive date of implementation, R&D was based on all “in house” manufacturing, so NEWP could control the entire process with lightning fast execution and accurate results. NEWP’s high tech stadium racks were utilized in stores across the country as Anheuser Busch’s primary beer display. Stores were able to easily swap out needed graphics, allowing them to use the displays for multiple events. Anheuser Busch was able to partner with sport entities such as NASCAR, NBA, MLB and the NCAA, in addition to the NFL. The same racks were used for two Super Bowls, one Stanley Cup, multiple NASCAR events, three NBA finals, and two March Madness events. Due to NEWP’s design offerings and creative thinking strategies, the project’s initial goal of a one-time marketing event transformed into a flexible sale’s vehicle that could be used more permanently throughout the year. Graphic packages were offered to different brands and events that prolonged the display’s sustainable life span. And as the design evolved to include these other brands and events, NEWP quickly solidified its place as a reliable provider.